Working In Protest from rumur on Vimeo. Last year we released a film called “Working In Protest” which was built from 30 years of work documenting various protests. The film was not a survey of protest in America, but instead a somewhat personal film constructed from work we had shot for various projects- and partly from pieces we made once we realized that we were making a film. The film was sparked by the discovery of some photos I shot at a Klan Rally in 1987. A few years ago, my family and I moved back into the house in North Carolina that I grew up in. We left Brooklyn for a number of reasons, but one of those was a desire on my part to reset in relation to my work as an artist. For 30 years, I had moved relentlessly forward and I wanted to step back a bit and think about what it was I wanted to accomplish. I spent a good deal of time thinking about the work that we had made, and looked for themes and ideas that held that work together. “Working In Protest” was birthed by that process, and the reflection backwards gave an increased sense of focus to the work moving forward. A few months ago when we showed the film at the Brooklyn Film Festival I did a short TV interview in which I talked about these ideas. While “Working In Protest” covers a pretty long time span, the bulk of it is from Occupy and beyond. I was inspired to go down to Occupy by the very powerful advocacy-oriented pieces that were shot in the early days of the protest by people like Alex Mallis and Lilly Henderson. This work made me want to see what was going on at Zucotti Park. At the time, my partners and I had recently finished Battle for Brooklyn, a verite, character-driven film about the fight against a developer’s effort to use eminent domain to grab a huge section of central Brooklyn to build several skyscrapers and an arena. Our main character owned a condo in the project site (at center court of the proposed arena), and he used his position as leverage to help the rest of the community fight it. We spent seven years shooting and editing and while the reviews were quite strong, we found it almost impossible to get it into film festivals or booked in theaters. Most reviewers in New York had a hard time believing the film could be accurate in it’s portrayal of the corruption between the developer and government. The developer had spent millions of dollars on PR and controlled the public narrative of the project. They had created an “astroturf” group to advocate for the project, and the press tended to focus on the story that the developer was putting out rather than what the community was fighting for. It was a story about kleptocracy as much as it was about our characters. When Occupy happened, people started to have a way to make sense of the film and interest took off. When I got down to Occupy, I found a leaderless, de-centralized movement that did not lend itself to the kind of character-driven work we had been doing. I started to shoot footage and post clips in an observational manner as I tried to get a sense of how to communicate about what I experienced. In my first trip, I mostly made images of people holding signs; protesters ringed the park holding various messages about inequality and abuse of power. A few days later, I went back and shot some video, simply asking people why they were there. As I got back around the park I found that many of the people who had been questioning the protesters were now holding signs. Why Are You at Occupy Wall Street from rumur on Vimeo. While I appreciated the advocacy work that was being done, I found myself wanting to make something less a part of the movement than about it. Around that time, I had put some old photos online from a project I shot in malls in 1989. Those images were street photos shot in several malls in 1989. At the time, I hated malls, but when I shot the pictures I wasn’t trying to make fun of anything. Instead, enamored with the work of William Eggleston and Gary Winnogrand, I wanted to capture the essence and feel of the mall. The pictures were mildly boring, but 25 years later, that banality makes them even more present-feeling. 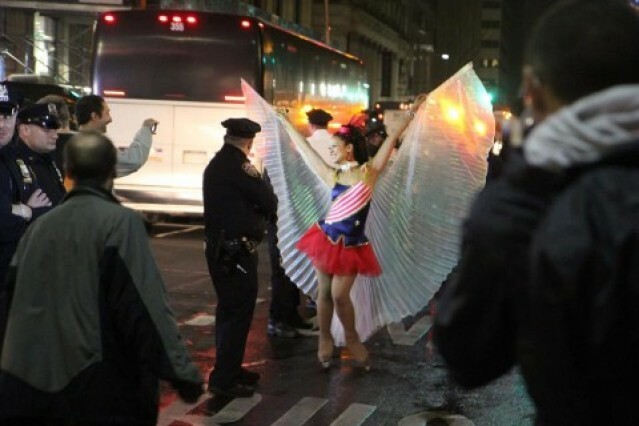 I was aware of this as I shot in Zucotti Park. I didn’t want to make “boring” work, but I was interested in capturing a bit more of the mundane aspects in order to create a sense of what it felt like to be there, rather than focus on the excitement or the “decisive moments”. Shortly after I started to shoot, I got invited to participate in a “collaborative” documentary about the Occupy movement. I was excited to be a part of it and gladly shared my footage. However, the discussion quickly turned to finding characters to follow – a standard practice in documentary filmmaking. I understood the impulse because characters allow us to become emotionally involved and to understand a situation from a personal perspective. However, I was very passionate about the idea that Occupy was a different kind of protest and that it required a different approach. I made the argument that the Occupy Movement itself was the character we needed to follow. In a private Facebook group discussion, the conversation was not very collaborative and it very quickly became clear that the people who started the project were less interested in making a collaborative film in the model of Occupy than making a film using the footage of “collaborators” who offered it up. I left the group. Month One from rumur on Vimeo. I continued to document the situation, and along with our friend Joanna Arnow we made the above short film about the first month of Occupy. While it is clearly impossible to make work that has no point of view, my goal in documenting protest from that point on was to do my best to be aware of whatever bias I might bring, and to document the situation as impartially as I possibly could. Our work asked people to put themselves in the situation and make sense of it for themselves. Even before Donald Trump came along, it was clear that our country was dividing into camps, rejecting information that didn’t conform to ideas the people already accepted. I had the sense that anything that felt like it was trying to inspire people to action, or to prove a point, would be rejected by those who didn’t already align with that point of view. The difference between what I wanted to create and the advocacy work that was being done was so subtle as to be almost unrecognizable, but it was an important difference to me. In general, the work that I see falls into one of two camps: advocacy work and journalism. The advocacy work is often designed to work as propaganda in some sense. Those who make it will often reject that idea because they see the work as important and needed. However, the term propaganda isn’t a judgment about the work, it simply describes work that attempts to influence someone’s thoughts or opinions. Even when making character-driven documentaries, we have been aware of this line and taken great pains not to make films that are so aligned with our characters that they might be taken as propaganda. When we made “Horns and Halos” about an underground publisher who re-publishes a discredited bio of GW Bush, we faced a situation in which half of the audience thought we were too hard on our character and half who thought we were unfair to George Bush. This made it hard to market the film, but it confirmed that we’d successfully avoided the propaganda trap. While we are adamant about not making propaganda, we also don’t see ourselves as journalists. In journalism, people are taught to provide the “who, what, why, when, where”. In some sense this leads to a desire to present people with clear and explicable information. However, when one is at a protest, it is often largely mundane and also confusing. Action takes place, and people run towards it without knowing what’s going on. The boredom inspires people to act out at times. We attempt to capture what it feels like at the event. This means that sometimes our work can feel a bit unfocused. However, it’s important to me to create a space in which people who weren’t at an event can make their own sense of it, in the same way that we do as we shoot it. We have shown Working In Protest all over the world, and hope to have it On Demand shortly. In the meantime, we have continued to make similar work and will construct a film from our coverage of the protests around the Confederate statue in Chapel Hill called Silent Sam. You can see some of that work at this post. Silenced Sam from rumur on Vimeo.